Flat fish like plaice are a great way to get kids eating fish, as there are no bones. Place the fish on a greased shallow roasting tray, skin side down. Season with salt and pepper and drizzle some vegetable oil on top. Place in the oven and cook for 10 to 12 minutes, until the fish is cooked through. Place the tinned tomatoes, butter and garlic in a small pot. Bring to the boil, then reduce to a simmer while the fish cooks. At the last minute, add the lemon juice and chopped parsley. 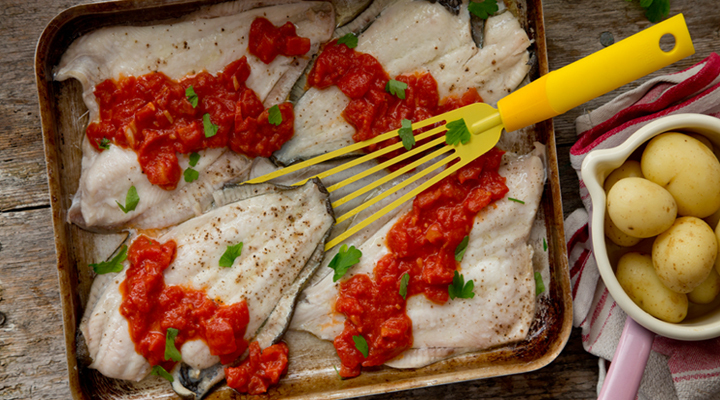 Remove the fish from the oven onto four plates and top with the sauce. Serve with steamed rice or boiled baby potatoes.